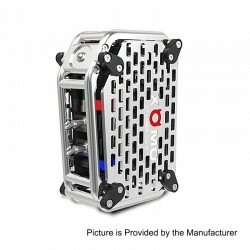 The Original XOMO GT Laser 255X Box Mod features 0.025s firing speed without any delay. The mod is equipped with the built in 3500mAh lithium battery and the maximum output can reach to 150W. The appearance looks so wild with metal frame and cover. XOMO GT Laser 255X will bring you different vape experience.This item also has many color to choose.